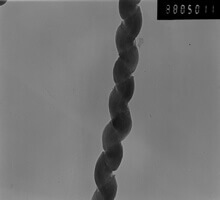 The content of helical structure CNTs in our helical multi walled carbon nanotubes is about 80wt%. The rest is regular CNTs. The total CNTs content is more than 90wt%, and most of the CNTs have 100-200nm outer diameter. Prices are per gram. Our Helical Multi Walled Carbon Nanotubes are made by CCVD and purified and functionalized using concentrated acid chemistry. Carbon Nanotubes have proven to offer a unique properties of stiffness and strength largely due to their high aspect ratio and all carbon structure. The thermal and electrical conductivity found in carbon nanotubes is very high compared to other conductive or fibrous additive materials. Surfactants are needed to stabilize dispersions in DI Water or other aqueous solvent mixtures. Carbon nanotubes are the strongest and stiffest materials yet discovered. The carbon atoms of a single sheet of graphite form a planar honeycomb lattice, in which each atom is connected via a strong chemical bond to three neighboring atoms. Because of these strong bonds, the basal plane elastic modulus of graphite is one of the largest of any known material. For this reason,Carbon Nanotubes (CNTs) are expected to be the ultimate high-strength fibers.